Pearl and rose quartz cluster earrings, "Pink Bouquet"
Rosebuds cascade in beautiful racemes, blossoming on silk vines. 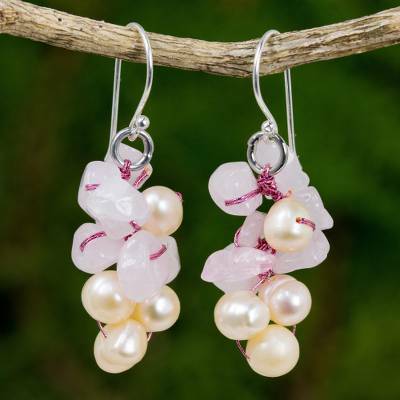 Nareerat crafts this elegant pair of earrings with pink iridescent pearls and glistening rose quartz, the gem of romance and love. The earrings hang from sterling hooks. To date, NOVICA has sent $90,900,573 to artisans!